Carney no longer worried about Canadian Housing Bubble? To be sure, Mr. Carney no longer sounds as worried about a housing bubble as he did last year. On Wednesday, he indicated that repeated warnings by him and Mr. Flaherty may be scaring Canadians straight, curbing their appetite for debt. But both men are up against history. 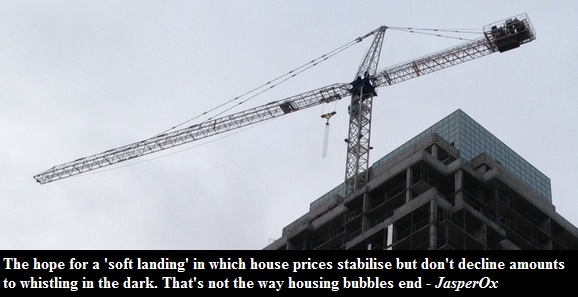 When property prices get this frothy, pendulum swings are more likely than soft landings. Such is the pickle in which Mr. Flaherty and Mr. Carney (at least until the latter’s departure for the Bank of England) find themselves. Their risky experiment in guiding Canada through the recession by stoking housing demand is threatening to come undone. Household debt (largely the result of ever bigger mortgages) remains much higher in Canada than it was in the U.S. just before the 2008 crash. It wouldn’t take much to turn a vulnerability into a calamity. Back in 2002, Paul Krugman famously said:- "To fight this recession the Fed needs…soaring household spending to offset moribund business investment. [So] Alan Greenspan needs to create a housing bubble to replace the Nasdaq bubble." And that's exactly what happened. Similarly in Canada, the so called "recovery" after the financial crisis was based on inflating the housing prices. The modest growth achieved during last four years was mostly fueled by real estate inflation. As sales tumbled over the last six months, no wonder last quarter's GDP was a dismal 0.6% increase. Instead of creating a sustainable growth model, Flaherty and Carney chose the easy way out by fueling a housing boom with low interest rates. As Carney is about to leave to England, he is shifting his attention to economic growth in Canada as he no longer fears the housing bubble. What Carney really doesn't fear anymore is the housing bubble inflating even more. A poll by Globe and Mail shows that 36% of the respondents think that Canadian housing bubble have eased, 45% don't think so, and 18% were not sure.